The Slimming World Files: Bad Day? Good Night! Most of the time I'm a happy little soul, I don't like being grumpy, stressed or miserable, but some days just do their absolute best to grind you down. I thought today was going to be one of those. I'd set an alarm to go out for a run, but instead woke up feeling like utter crap. Totally shattered and not in the mood to run at all. Thing is, when I'm heading home from work I'm totally fired up to go out, but it's far too late and dark. It doesn't help my mood. I lazed about in bed for a while before I had to get up and then was faced with the wonders of dealing with the Amazing Disappearing Television along with Hague. In between typing angrily to Tesco customer service reps I had a quick breakfast. Eggs and tomatoes on toast, washed down with a couple of coffees. After numerous bugger ups by Tesco, including the advice that all they could do about the "lost in transit" television was refund us and email us when it was back in stock, with a refund taking up to 5 working days, which I'm sure you'll agree is very helpful on December the frigging 12th, we finally got another television ordered, to be sent to the right person, on a day when it could be collected. That didn't actually happen until I was at work though - shows just what a pain in the arse morning it really was! So I'm sure you can understand that I got to work stressed and annoyed, leaving behind a stressed and annoyed Hague, not a great place to be. Work was busy too, and as I'm training I was doing most bits and bobs myself which meant my first break didn't arrive until 3 hours into my shift. Good old banana and cereal bar, Alpen lights still as Benefits are still AWOL :( I then had to get stuck into a size change, which entails replacing lots of the filler machine parts to run a different size bottle, the first time I'd had a crack on my own, so it was a good two hours before I got my next break, at 8pm. When I finish work at 9.45! Whooops! I did manage to get it all done though, which I was rather chuffed about! So there was a bit of a chink of something good in a crappy old day. A belated lunch there! Just yesterday's leftover pasta and an apple, at that point I'd have eaten anything, I was starving! So after that it was a hop, skip and jump until the end of the shift, and freedom! Just before freedom though I was stopped by my manager and presented with a rather lovely, but not overly SW friendly "thank you"
I do moan about work, a lot, but it was rather nice to receive a thank you for our safety record over the last year, and a £10 Tesco voucher too - really can't complain about that and it did chirp me up a bit, but then...well I checked my phone and I'd had a text from Hague saying he'd been retweeted by Julian Dicks. Now, I appreciate I may have lost a few of you here, but if you're around my age, and enjoy your football then I would hope you have heard of the footballing legend that is Julian Dicks. He played at left back for West Ham (amongst others) and was my first footballing idol. 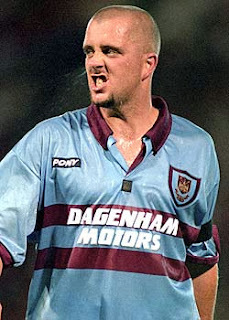 I loved the way he played, I loved the way he never gave up and the passion and skill he showed on the pitch for my beloved West Ham, I had pictures on my wall of him and even now use his number, 3, in most of my online usernames. Obviously, as you can see by that glut of information, I idolise him a tad and so was muchly excited that Hague had had a brief interaction with him....so a rather excited me then checked Twitter to have a look, only to find he was now following me, and had sent me a PM. I think the text I then sent Hague said it all..."OMGOMGOMGOMG" Sorry for the overexcitement, but it turned my day totally round, and I drove home with a total grin on my face! So a very, very happy me arrived home rather bouncy to a rather amused Hague and then settled down to another meal and a chat with a legend. I decided to splash out on more Graze snacks, once more atop some figs and yogurt, delicious. What a day :o) I really did think that today was going to end up as being supremely crap - I'd already dubbed it the day from hell, but here we are, at the end of the day and I'm a happy little bunny once more, a much better place to be methinks! Madness! Just 3st 2½lbs left to shift!